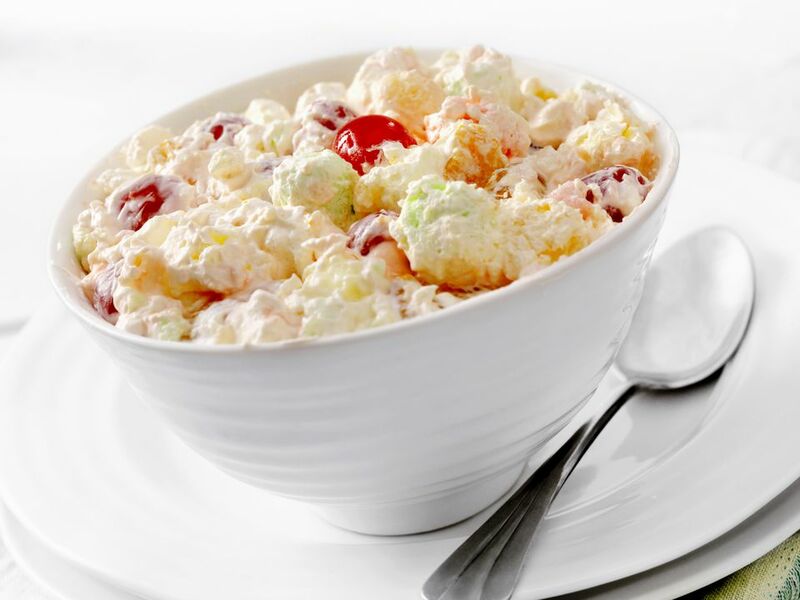 Ambrosia is a fruit salad popular in Southern cooking, usually made with fruit, yogurt, and coconut and is often made with tropical fruit, such as pineapple. This is a dairy-free, cholesterol-free, and vegan ambrosia fruit salad recipe, using tofu instead of yogurt for a very low-fat but still creamy vegan ambrosia salad. In fact, it's nearly fat-free. The tofu in this ambrosia adds just a trivial amount of healthy fat. In a large bowl, toss the fruit and coconut until well blended. Refrigerate. Combine the cornstarch with the lemon juice in a medium saucepan and stir until well blended. Place the saucepan over medium heat and add the sugar and orange juice. Cook, stirring constantly, until the mixture thickens, about 5 to 10 minutes. Remove the saucepan from the stove and allow to cool thoroughly. Fold the pureed tofu, orange zest, and poppy seeds if using into the juice mixture and chill for at least one hour. Immediately before serving, pour the dressing over the fruit and serve.